A cost-effective way to enhance your voice and add harmonies that can be pitched to follow your guitar. Harmonies generated from guitar. Dedicated footswitch for harmony switching. Two different patches instantly footswitchable. Setting the key manually requires a lot of footswitching activity. There was time when it was only guitarists who used stompboxes, but lately vocalists have been getting in on the act with specialised pedals that can generate harmonies, add reverb and even correct their out of tune warblings. We've already taken a look at the various models in the DigiTech Vocalist range that can automatically generate vocal harmonies dependent on an input signal from your guitar. 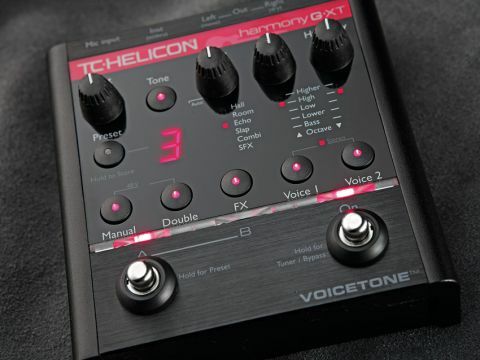 Now up for review is the TC-Helicon VoiceTone Harmony-G XT, which does a similar trick. "The Harmony-G XT reacts solidly to your guitar chords, with some musically valid harmonies that complement your singing and playing." The Harmony-G XT is the successor to TC-Helicon's Harmony-G vocal effect and takes some features from the more upmarket VoiceLive 2. It's designed to provide a variety of effects to enhance any singing performance including, among others, harmony generation, doubling effects, reverb, delay, compression and automatic chromatic pitch correction. Operation of the Harmony-G XT revolves around 10 programmable presets arranged in five banks as variations A and B. You can step through the banks with the preset button and switch between the A or B variations with the left footswitch. Each preset can be built up from several elements. You get two harmony voices (Voice 1 and Voice 2), each of which can be chosen from six options or simply be inactive. Voice 1 offers higher, high, low, lower, bass or octave up harmonies, while Voice 2 replaces the octave up option with octave down. You also can have no effects or a choice of hall reverb, room reverb, echo, slap, combi or SFX. The levels of the effects and the harmony voices are set by separate knobs and each of the effects has selectable variations. On top of this you can engage the double button, which activates a doubling effect (with four different options) on your voice that you can use alone or in tandem with the harmony voices, and there's a tone button that with a single press adds what TC calls 'Adaptive Live Engineer Effects' - a combination of EQ, compression, de-essing and gating - to smooth the vocals. A double press on the tone button engages the automatic pitch correction if you want to add that in as well. A thru jack takes the guitar signal to your amp, although it can be mixed in with the voice signal if required and share the reverb, the relative levels set by a knob that has an auto setting and an area in its travel when the guitar is muted. The idea is that you play your guitar to generate vocal harmonies, although there's also manual selection of scale and key for singers without an instrument or horn players. You can also use a guitar to manually set a key by playing a chord and holding both footswitches down. TC's VoiceSupport software is included and is designed for backing up and restoring user presets and installing any updates to the pedal. Tweaking the Harmony-G XT's 10 presets is pretty straightforward and, once you've programmed in the combinations of harmonies, doubling and effects that you want, onstage use should be easy enough. The right footswitch turns the harmony and doubling effect on and off but keeps any effects that you may have added to your voice (holding it down engages bypass and accesses the onboard guitar tuner). Quick level tweaking is possible via the knobs. The centre detent positions of both the FX and harmony knobs provide a balance that works well, but it's an instant fix if you want slightly less harmony or the reverb off completely. If you have just two favourite settings, you can switch between them with the left footswitch and not have to worry about touching the pedal at all. The effects sound classy with the default sounds, but there's variety available if you want it, with three options for each FX type and four variations on the doubling effect. TC-Helicon is the branch of the TC group that specialises in vocal effects, so it comes as no surprise to find that the harmonies sound really good whether they're being generated from your guitar chords or via a key that you've selected. High and higher centre around a third and a fifth above your voice, while low and lower centre around a fourth and a sixth below and bass sings the root of your guitar chord even if you're singing other notes. Tracking is good and the Harmony-G XT reacts solidly to your guitar chords, with some musically valid harmonies that complement both your singing and playing, as long as you can coordinate the two. The process is probably not something you'd want to undertake on-the-fly at a live show, but with practice you get the hang of it. This pedal offers creative possibilities for vocalists and may be particularly suited to solo acts that want to add a little interest to their music or just present a bigger sound to their audience. Bear in mind, though, that this type of pedal demands to be used with caution, vocal pitchshifting technology isn't without odd-sounding artefacts and a shift of just a few semitones can sound unnatural if mixed too high in relation to the main vocal. Keep the levels reasonable though (and sing in tune!) and you'll be rewarded with generated harmonies that will enhance your performance.